Need birthday invitation cards? 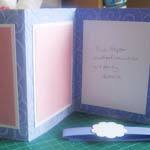 These purple invitations were made with a kind of accordion fold. Two of the folds will hold a photo of the birthday girl and the third spot is for the invitation wording itself. 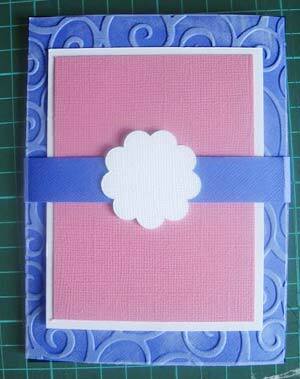 You will notice that the purple cardstock has a nice swirly design that is raised. This effect is acheved by dry embossing and gives your card texture. This card was made with a fancy embossing tool called the cuttlebug, it creates the design on the whole card in a few seconds. 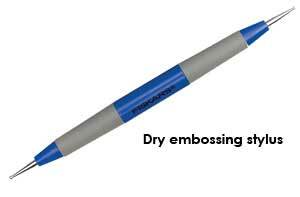 Basic dry embossing is a little more labour intensive but only requires an inexpensive embossing stylus and a stencil with a nice design. You can pick up both items for a few dollars. You then take your card, place it wrong side up over the stencil then use the stylus to trace around the stencil edges. When you're done you pick up the card, flip it over and there you have a perfectly raised image. 2 pink mats 2 3/4" x 4 3/4"
White cardstock embellishment for the belly wrap. This can be a scalloped circle, a heart, shell etc. This will have the childs age or first initial on it. Adhesive, paper trimmer and embossing equiptment if you want it. 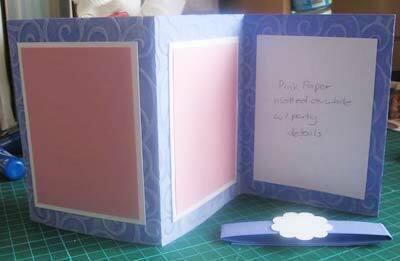 Take your 12"x6" strip of card and fold it accordion style at 4" and 8". The card in the example picture has been embossed with the cuttlebug and then white ink has been lightly brushed over the surface to hilight the embossing creating an even more interesting look. This is of course optional, we can leave the card as it is and it will look great. Open up the card, you will have 3 panels. Center and adhere two of the white mats to the first two panels. Take the pink matts, center and stick them to the white panels. Take the third white mat, write out your party information on to this card and then center and glue it to the third pane. You may choose to type up your birthday party details on to a word document and print them directly on to the card. This will save you some time and will help to create more consistent invitations. Trim a couple of photos and sick them to the pink mats. Fold the invitation closed and wrap around the belly wrap strip. Glue the ends of the wrap together at the back of the card. Adhere the embellishment to the front of the bellywrap.